Proper identification of the nematodes is important. A laboratory test is necessary to confirm this disease. 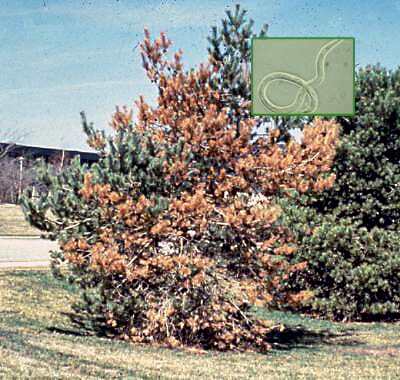 The pinewood nematode causes the disease Pine Wilt. Scots, Austrian and Japanese black pines are the most susceptible. It has also been found in other types of needle evergreens such as larch, balsam fir, spruce and deodar and Atlas cedar. North America, Europe, Mexico, Japan and throughout Asia. symptomd on most pines infected in the spring are often dead by late summer to early fall. Large trees may take two years to die. Vigor of plant does not seem to have a bearing on which plants become infected. Infected plants quickly become stunted. Foliage begins to fade to an off green or slightly yellowish color before turning brown. Dead needles hang on to the branches for a long time. On large trees that take two years to die, the older needles turn yellow first and fall off before the younger needles turn brown. These symptoms can occur any time midsummer to late fall or late winter to spring. Trees infected in the fall do not break bud the following spring. Pines under stress are more likely to be killed by the pinewood nematode. Pine sawyer beetles (Monochamus carolinensis) which are native longhorns, are known to transmit this nematode. The nematode can take between four and twelve days to go from egg to adult depending on temperature. Females lay dozen of eggs over several weeks before dying themselves. The nematode breeds fairly rapidly and sometimes, in association with bacteria, quickly causes the vascular tissue to plug, killing the tree. The nematode alone can cause the tree to die. The nematode feeds on plant tissue or fungal mycelium such as blue stain canker mycelium.